Disk Wipe is Free, portable Windows application for permanent volume data destruction. ##What is Disk Wipe? Disk Wipe is Free, portable Windows application for permanent volume data destruction. With Disk Wipe you can erase all disk data and prevent recovery of those data. Formatting a hard drive with regular method leaves an open possibility to recover the data back. Many companies and users who just dumped their old hard drives in rubbish had found this the hard way. Disk Wipe solves this problem efficiently, using a powerful algorithms which fill the volume with useless rubbish binary data multiple times. The possibility of recovering information from drive formatted with Disk Wipe is almost non existent. Disk Wipe is released as Freeware under EULA Licence. Disk Wipe is free for personal or commercial use, without any restrictions. Disk Wipe does NOT contain adware or malware! Disk Wipe is free software, support it by telling others about it. 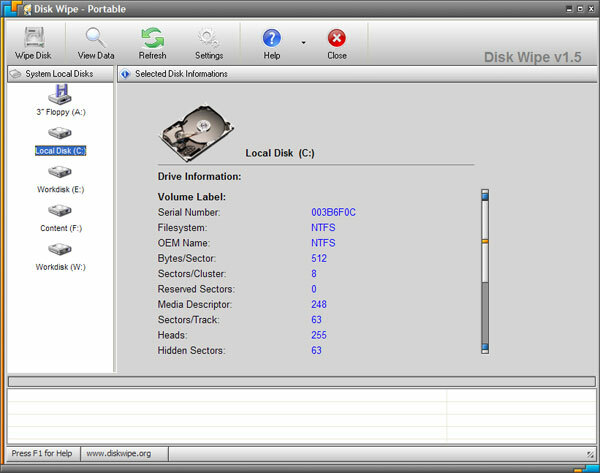 ##Features of Disk Wipe * Permanently wipes sensitive data on partitions and disk volumes.